Hey there! My name is Charity. I’m 25 years old, originally from Milwaukee, WI. I’ve lived in Colorado since I was 7, so most of my life (still a Packers fan though!). I work in the mental health field with individual diagnosed with severe and persistent mental illness. I love the work that I do and I have learned in that work that you have to keep yourself healthy and happy to keep going and be able to give to others. When did you join CrossFit Stapleton and Why? I joined in July 2015. My best friend, Rita, had been going to CFS for close to 2 years at that point and had always talked to me about trying a class. I was on the fence of wanting to make a major change in my life and she finally told me one day to come and give it a try. It was a Wednesday class. I fell in love and signed up the followingSaturday. What was your activity level like before CrossFit? Very minimal. I had tried other gyms in the past and went pretty inconsistently. Same with at home workouts. I would get physical activity once a week, maybe. 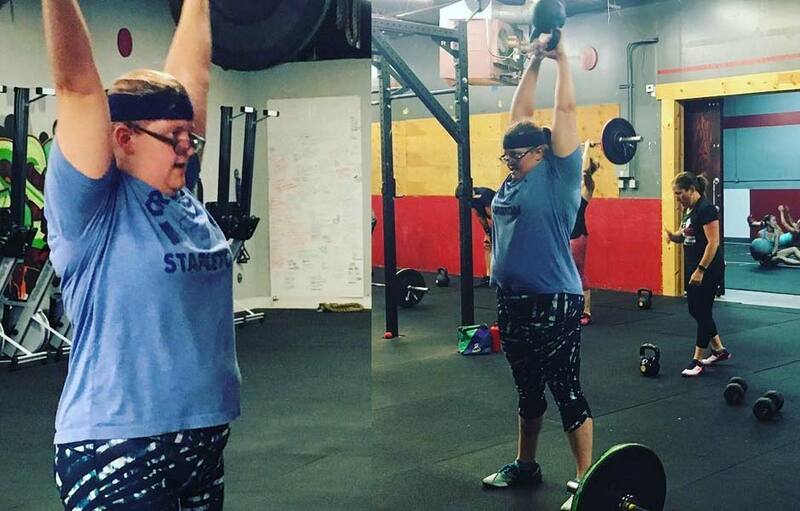 What do you like most about Crossfit Stapleton? I love the community that we have. People notice when you miss a class and they actually care if you do. People at CFS genuinely care about each other and I think that’s the biggest reason I keep coming back. How has this changed you in other parts of your life? Nutrition for sure! I’m still guilty of eating out, having a beer or a donut. But I care so much more now about what I’m putting in my body and making sure that I am getting the right nutrients. It’s a constant struggle for me because food was a big comfort for me, so I had to change my relationship with food. I also have gained so much confidence from starting Crossfit. People can judge me all they want, but at the end of the day, I know what I’m doing for me and that’s all that matters. What goals has crossfit helped you reach? In terms of fitness, I have been able to reach so many personal records that I never dreamed possible for myself. I’ve done in house competitions which was such an amazing experience. I still have several goals that I am working on and I think that is one thing that I love about CFS is that it keeps you pushing yourself to the next goal. Is there is really something unique about our program that if different from anything else out there? I love that the programing is so varied. Other than the Benchmark WODs, I don’t think that I have ever repeated a work out. It keeps you guessing all of the time. It’s something new and challenging every day. It makes you push yourself in ways that didn’t seem possible. If I had told myself a year and a half ago that I would still be doing Crossfit and waking up before dawn to go to the gym, I would have told anyone that I was crazy. I think I have even surprised myself and if I can give anyone any advise or words of wisdom it would be…don’t give up on yourself. You are capable of so much more than you know and so much more than you give yourself credit for. Keep going. Keep trying. You’ll be amazed what you achieve and you’ll have the best community behind you cheering you on.